Successfully Added DVR Card - 8 Video and 4 Audio CH (Motion Detection, Alarm, TV) to your Shopping Cart. DVR card with 8 channel video input, 4 channel audio input and a TV out - Turn your computer into a digital video recorder and capture live video feeds directly to the hard drive or for viewing on your TV. This DVR Card is easy to install and even easier to use: simply connect it inside your computer, install the drivers, plug in the security camera through the handy BNC connectors, and you'll be up and running with the ability to record and monitor amazing realtime surveillance footage from up to 8 security cameras. If that's not enough, the DVR card can also capture audio from up to 4 channels so you are sure to have the context to go with the content. 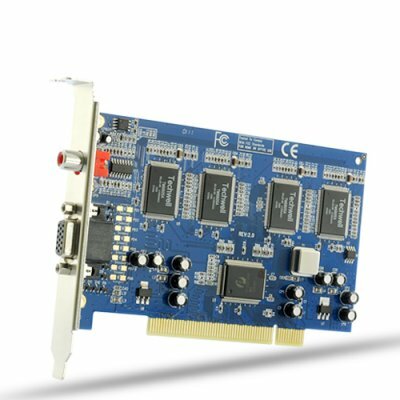 Along with a single TV out slot, this DVR card has everything you need to create a high quality surveillance system that you can view on the large screen. This DVR card also has the ability to save videos and take picture snapshots onto your computer and categorize them for future use. Video recording file size ranges from 600MB/hour to 100MB/hour, so you can go for quality or quantity, whichever fits your needs! Combined with features such as programmable timer recording, alarm triggered recording, motion detection recording and pre-alarm recording, you can be sure that your security system is keeping full alert around your place when you're not present. Along with the camera pan/tilt/zoom functions and an easy to use graphical user interface, you'll have complete and total access straight from your computer. Search Google and you’ll see how the same DVR card sells for more than double the price. If you’re looking for a solid resale item that can make you some great profit before everyone else, then this is that product. Place your orders today while supplies last and we will express ship it to you by tomorrow. Don't forget, this DVR card comes with our famous 12 month guarantee and is in stock now in our warehouse right now. Brought to you by the leader in wholesale electronics, Chinavasion! Minimum 100MB/hour recordings, maximum 600MB/hour. Can I use this with my Windows 7 or Vista computer? Yes, the software is compatible with Windows 7 (32-bit) and Vista (32-bit). The card itself is a PCI card that will work with most computer systems. Why is this DVR card so cheap? Most of the ones here in Germany cost at least three times as much! Be sure your graphics card driver is properly installed and upgrade to the latest driver version.